Transmit data quickly - up to 867 megabits per second (Mbps) - with the BAT867-R industrial wireless access point. This device supports high-speed IEEE 802.11ac data rates, making it the fastest wireless device in Belden’s portfolio. Fast data speeds - Enable high-speed data transmission up to 867 Mbps with a IEEE 802.11ac radio module. Also backward compatible to a/b/g/n standards. Industrial design - Comply with the challenging requirements and approvals of industrial markets and be confident your device can withstand signal interference, vibrations, EMC and more. Cost-effective Solution - Only pay for the features required by typical industrial WLAN applications to reduce your overall costs - one radio, one Ethernet port, one power supply. Can be used as an access point, client, router or bridge. 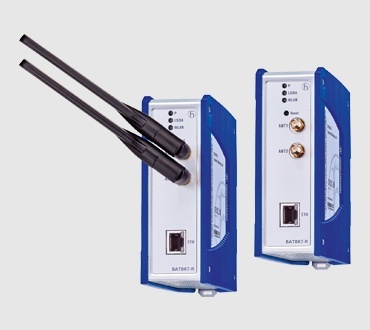 Reliable wireless connectivity - Enjoy flexibility by monitoring and operating machines from wireless tablets or smartphones. Also improve warehousing efficiency by providing wireless connectivity for moving vehicles, such as forklifts and automated guided vehicles (AGVs). Download this white paper and learn how PRP is a game changer for industrial wireless and how it might solve your application challenges. Download the application note and you'll be on your way to improving your Wireless knowledge to enhance AGV manufacturer to provide highly available communication for increased productivity! Download this white paper and you'll be on your way to knowing how to improve WLAN performance in industrial applications.